To provide sufficient support for a rotating shaft or journal, it is important to choose a hydrodynamic bearing design with the right load capacity. If the applied loads are greater than a bearing design can handle, it can cause excessive wear and instability. 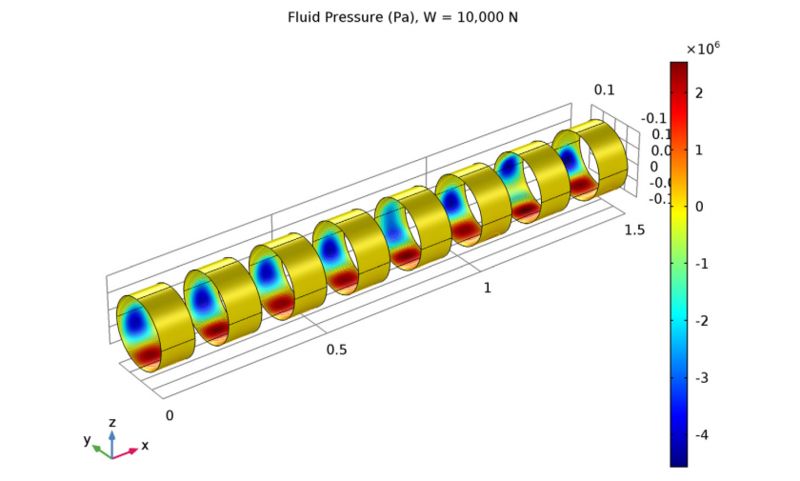 With the Rotordynamics Module, an add-on product to the COMSOL Multiphysics® software, you can compare the load capacities for different types of hydrodynamic bearings and determine which one is best suited for your particular application. From electric motors to steam turbines, hydrodynamic bearings — a type of fluid bearing — provide support to rotors in a variety of industrial applications. Valued for prolonging both the life span and quiet operation of components that rely on them, these bearings are designed to support heavy loads and reduce sliding friction and vibrations through the use of fluids that are pressurized, such as oils or gases. In a hydrodynamic bearing, the pressurization of the fluid takes place through a “pumping effect” promoted by the fast-moving journal, which pumps the fluid through the convergent section of the gap between the journal and the bearing. 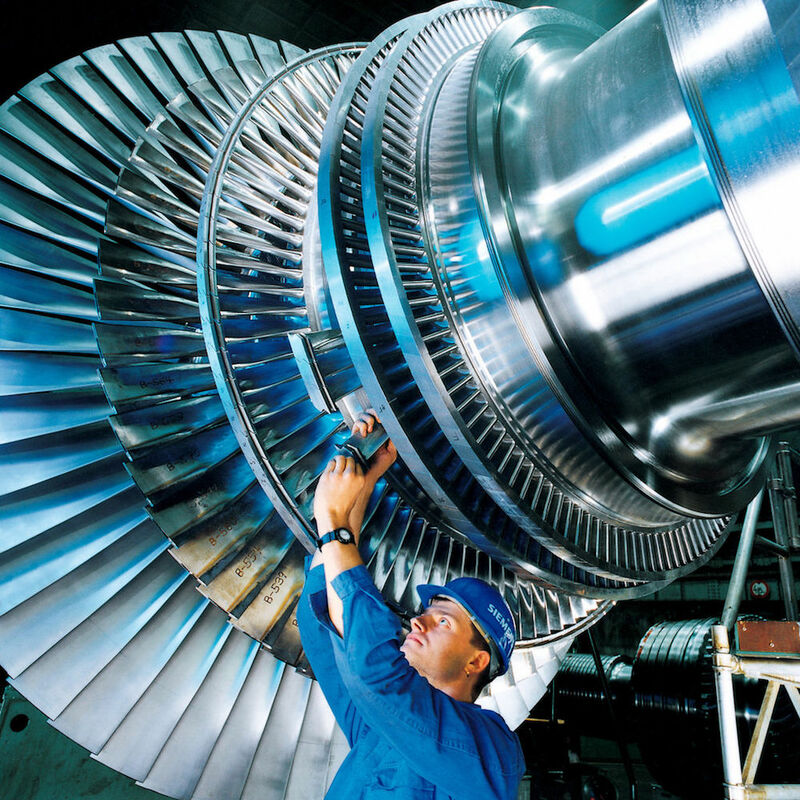 Steam turbines are just one industrial application of hydrodynamic bearings. Image by Siemens Pressebild. Licensed under CC BY-SA 3.0, via Wikimedia Commons. For a hydrodynamic bearing to perform efficiently, its load capacity needs to correlate with the requirements of the application. As such, it is important to understand how different types of hydrodynamic bearings react to loads and use this knowledge to choose the appropriate design. With the Rotordynamics Module, you have access to features and functionality that are needed to perform such analyses. Note that the configurations of the three- and four-lobe bearings differ from one another in regards to their relative orientation with respect to the static load. In one configuration, the static load acts on the center of the pad; hence, this configuration is called the load on pad or LOP configuration, while in the other, the load acts between the two pads and is called the load between pads or LBP configuration. Within the journal bearing, the journals rotate at an angular speed Ω (rad/s). In regards to the static position of the journal, it is obtained in such a way that the net force resulting from the fluid film in the horizontal direction is 0. This same force balances the journal weight W in the vertical direction. Various bearing configurations. From left to right, the top row features the plain, elliptic, split-halves, and two-lobe bearings. The bottom row features the three-lobe LOP bearing and three-lobe LBP bearing as well as the four-lobe LOP and four-lobe LBP bearings. The table below summarizes the values that are used in this simulation. They are similar to the values of lubricating oils that are used in actual bearings. To begin, we can look at the fluid film pressure profile for the different bearing types, in order to get an idea of the pressure distributions. 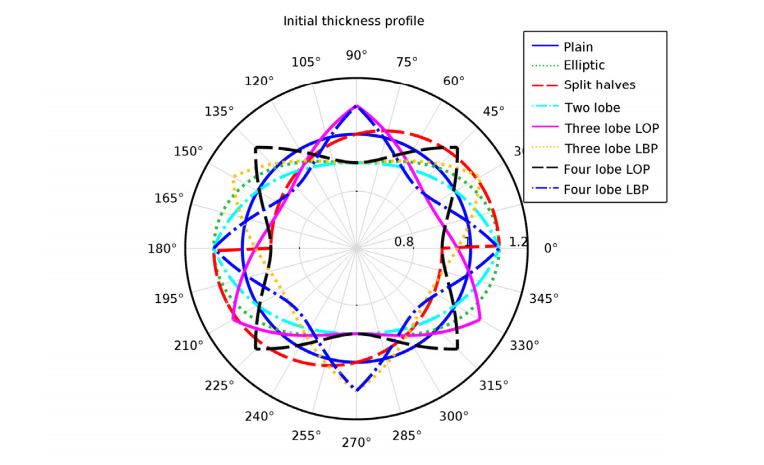 Pressure distribution in the plain, elliptical, split-halves, two-lobe, three-lobe LOP, three-lobe LBP, four-lobe LOP, and four-lobe LBP bearings. Pressure in the film increases in the convergent section of the film and rapidly decreases in the adjacent divergent section. In order to more easily investigate the results from the 3D plot, let’s look at a 2D plot where the cylindrical surfaces are unwrapped into rectangles. 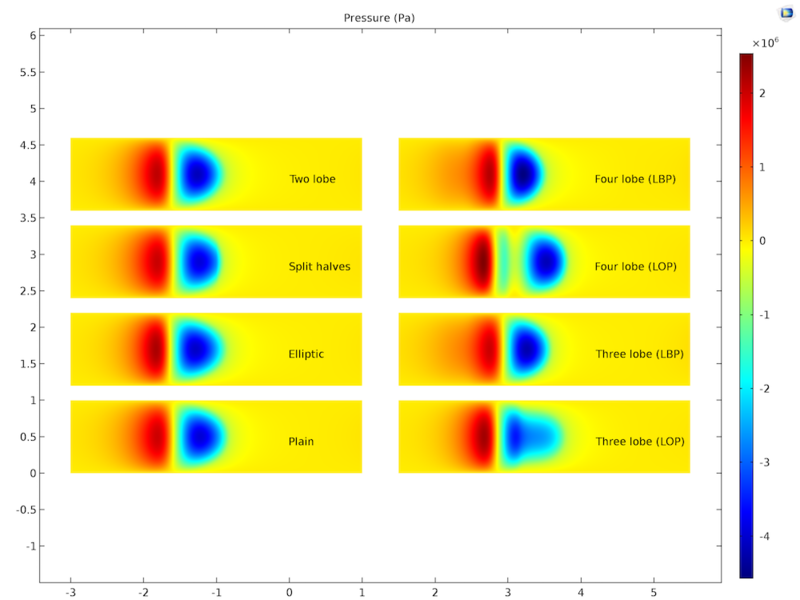 From the below plot, it’s clear that the clearance profile of the bearings has a strong influence on the pressure distribution in the film. Pressure profile in the fluid film for different bearing types; the x-axis represents circumferential direction and y-axis represents axial direction. In the next plot, we compare the journal eccentricity to the load. The favorable journals are those that exhibit less eccentricity. 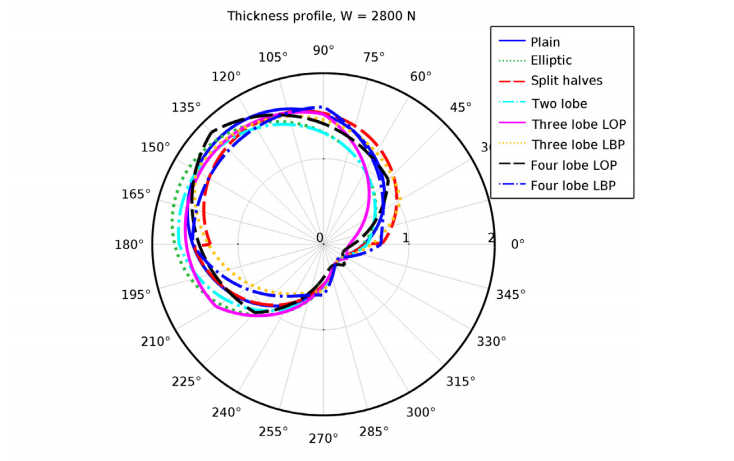 The plot shows that the bearings with the optimal eccentricity in the operating range are the split-halves and three-lobe LBP types. In cases where the loads are greater than 5000 N, the four-lobe LOP type has the highest eccentricity, while the four-lobe LBP has the lowest. Now, let’s look at the equilibrium position of the journals for different static loads on the bearing. The y-coordinate of the journal position is plotted on the x-axis, while the z-coordinate is plotted on the y-axis. 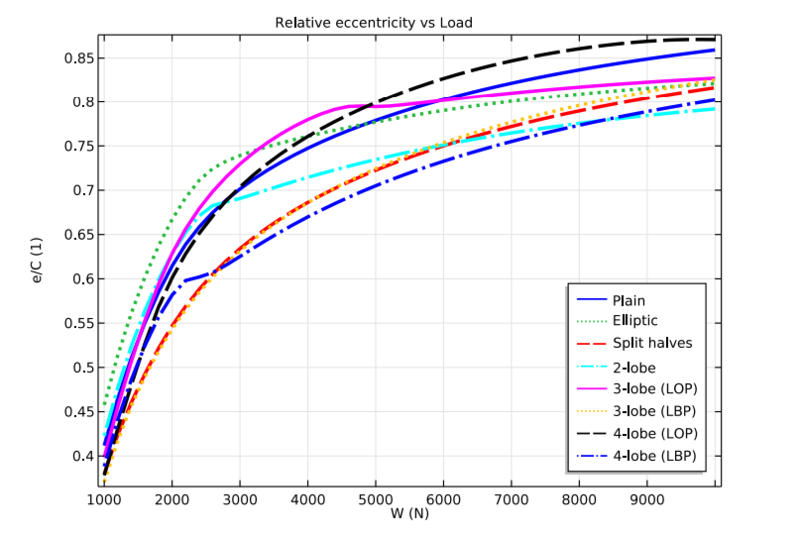 As the position relates to the magnitude of the load that is applied, we can also see its effect in the plot. If the load is smaller, there is a tendency for the equilibrium position of the journals to move primarily in the y-direction, with slight movement in the z-direction. When the load is greater, the journals move in the negative z-direction very rapidly. Beyond a threshold load, the journal comes into contact with the bottom part of the bearing. This sets a limit on the load-carrying capacity of the bearings. This curve helps you determine the limiting load that a bearing can withstand for safe operation for a given value of the journal eccentricity. 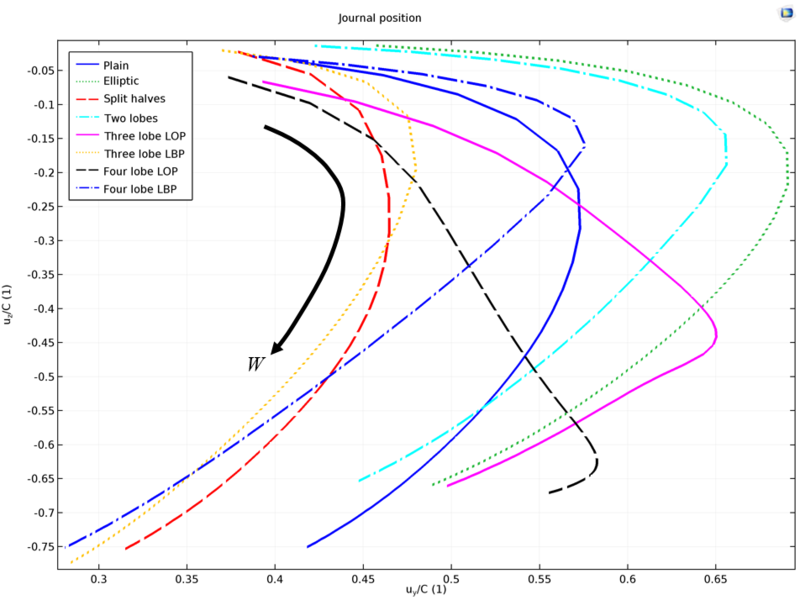 Finally, we analyze the fluid thickness profile in the reference state (when the journal is concentric with the bearing) and in the equilibrium state (when the journal is offset from the bearing center to balance the given static load). Our definitions of the geometric parameters are such that all of the bearings have the same minimum and maximum clearances in the reference state. The only exception to this is the plain bearing, where the clearance in the reference state is constant and equal to the mean value of the minimum and maximum clearances values in the other bearings. In the loaded state, all of the bearings have approximately the same minimum clearance occurring in the same azimuthal coordinate. However, the maximum clearance occurring at different azimuthal coordinates for the different bearings varies significantly. The fluid thickness profile at the reference state (left) and at equilibrium state (right). You can take this tutorial model for a spin by downloading the .mph file and accompanying documentation from the Application Gallery online. Note that you can also access these files directly within the product via the Application Libraries. 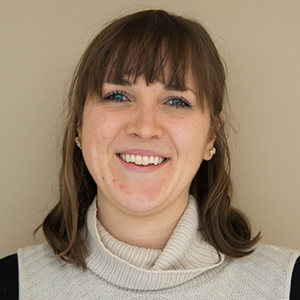 Not yet a COMSOL Multiphysics user? Contact us for a software evaluation.